The Attack of the Patatoids! Last day i was reading the wikipedia article about the Pioneer program. I don’t know how, but after following some links i ended on the Hayabusa mission article. The Hayabusa space probe was launch in 2003 to study the Itokawa asteroid. The most ambitious part of the mission was about landing on the astoreid to collect samples. From what i understood, the samples would not have been collected by drilling the asteroid but from the debris made by the collision between the asteroid and a projectile launched from the space probe. Unfortunately, the attempts to land on the asteroid failed. Nevertheless, it seems that the Hayabusa managed to collect some samples. The Hayabusa may be bak to earth around 2010. 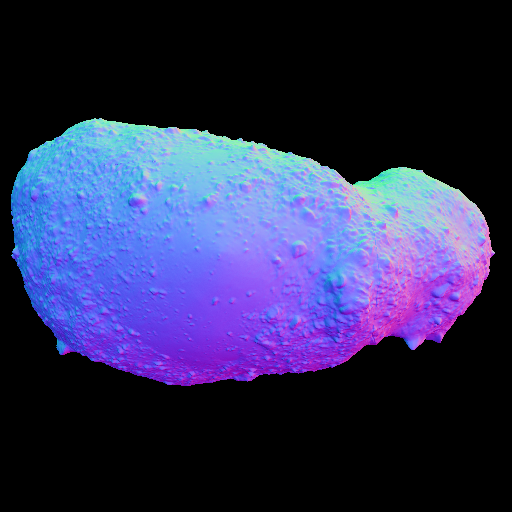 Using the data collected, Robert Gaskell from the Planetary Science Institute generated 3D models of the Itokawa asteroid. The model is available in 3 formats (plate-vertex table, STL ASCII and triangle) and in 4 resolutions (from 49,152 to 3,145,728 triangles). The plate-vertex table format is similar to ply2 format. So, i took the 3M triangles version. Translated it into ply2 and launched my crappy raytracer on it. As you may have noticed there’s a bug on the left part. Here’s a close up. The “correct” image was obtained after 3 hours of computation by disabling BVH. So the problem came from the BVH code. After almost rewriting the BVH building and intersection code, i still had the same bug. Some heavy code review later, i realized that the wrong ray intersection was returned. In fact it was the informations of the last intersection instead of the one from the closest intersection point. It’s a very stupid bug. Well at least i cleaned up the BVH code. 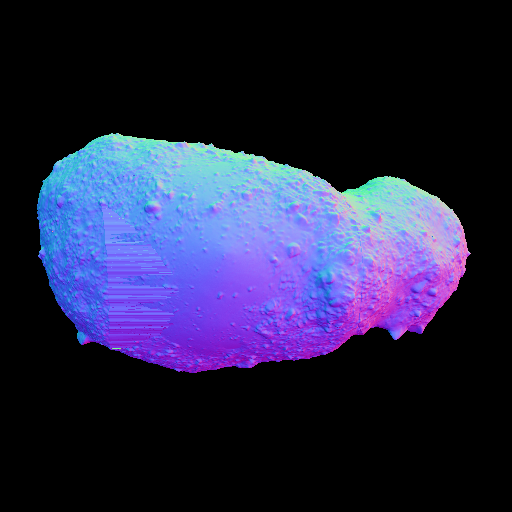 So for your pleasure here is a nice 512×512 image of the Itokawa asteroid. Bonus : dark side of the patatoid! There’s a huge problem here. We are assuming that each polygon (triangle in this case) are ordered so that its normal is pointing away from the object. Unfortunately, this isn’t guaranteed by ply2 format. The following figure illustrates this. Imagine if t0 and t1 are coplanar. If we are in the worst case, the normals of t0 and t1 are pointing in the opposite directions. As the normal at p is the sum of those two normals, it’ll be equal to the null vector. That explains the black holes. But that’s not all… The normal at the intersection point between the ray and the triangle is interpolated from the point normals of the triangle using barycentric coordinates. One of these 3 normals may be wrong or/and, like the figure, they may be pointing in opposite directions… Arg! There’s no exact way to determine if a polygon normal is pointing away from the surface. 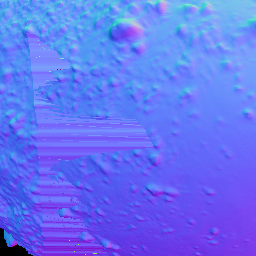 So, unless the file format provides polygon (or in the best case) points normals, i’ll not interpolate point normals. 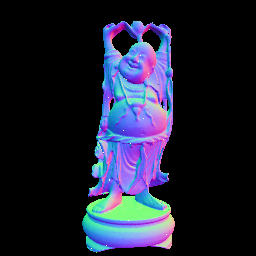 I backported the BVH i wrote for CRBN to the little and ugly raytracer test. Even if it’s not the most efficient space partioning method for raytracing, the improvment is quite impressive. 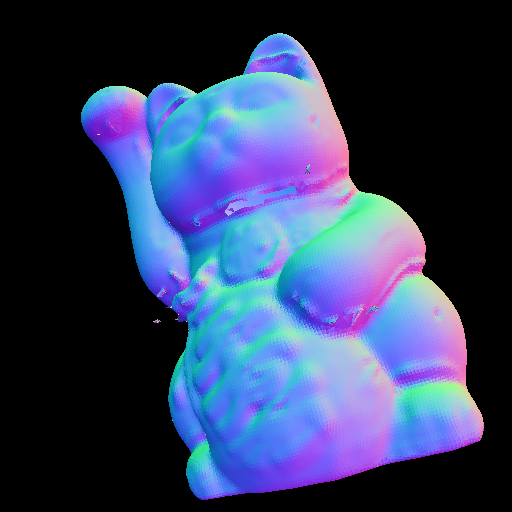 Here’re some results with the Maneki Neko model rendered on a Athlon XP 1.4GHz with 1GB of RAM. The model contains 62385 points and 124677 triangles. The code was compiled only with the -O flag and the target image was 256×256. Nice heh? So i decided to render something a little bit bigger. 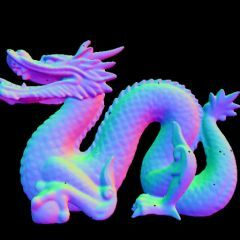 I chose the dragon hi-res model. It contains 437645 vertices and 871414 triangles. I haven’t tried rendering it without BVH. The 512×512 image took 2minutes to render. Unfortunately, i still have some floating point issues. You can notice holes here and there… I’ll made some tests using Plüecker coordinates as it’s supposed to be more robust. I decided to render a larger model. So i took the happy buddah model from stanford repository. It contains 543652 points and 1087716 triangles. Rendering a 256×256 image took approximatively 2 hours. I really need surface partitioning. It took 25 minutes to render this image on my amd64 3500+. The model contains 62385 points and 124677 triangles. Not that much… But it’s brute force raytracing for the moment. I also discovered that XYZ-RGB is offering free texture materials. 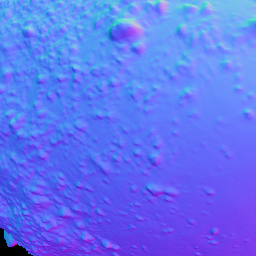 Maybe i should use them for the displacement map. On the 8bit side, the pcengine tracker is going well. The instrument routines may be finished next week. Next step is note/pattern handling.